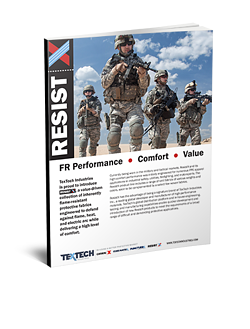 Tex Tech Industries is the proud manufacturer of ResistX, a value-driven collection of inherently flame-resistant protective fabrics engineered to defend against flame, heat, and electric arc while delivering a high level of comfort. For quick reference, we have provided a downloadable copy of our ResistX Performance Data Sheet, which you can access by filling out the form on this page. Tex Tech Quality Policy: Tex Tech will meet its customers’ needs and requirements by providing the best value through leadership and continuous improvement of process, service, and the Quality Management System.